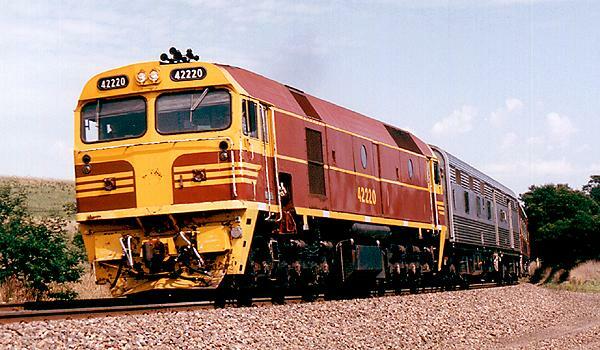 The 422 class was built by Clyde Engineering at Clyde, NSW. 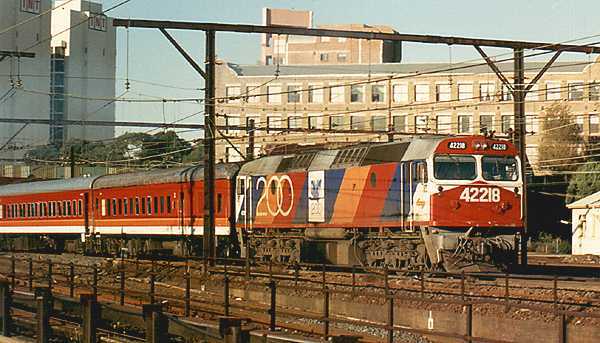 The first unit was in service on January 25th, 1969. There were 20 units in the class, numbered 42201-42220. They have a V16 Blower scavenged 2 stroke GM-645E engine. They weigh 110 tonnes and have 2000 HP available for traction. 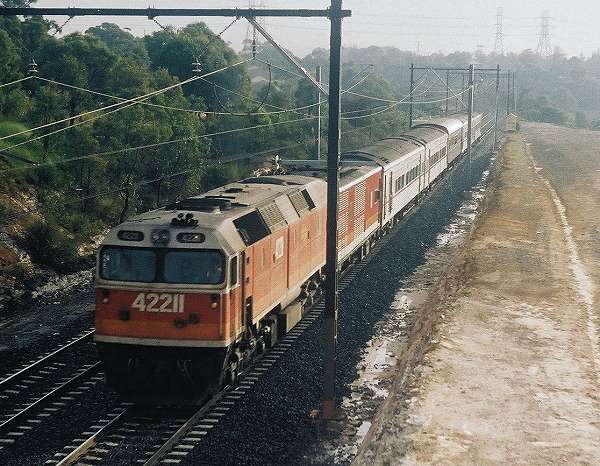 42213 on CL70 from Moss Vale passes Como station in March, 1990. 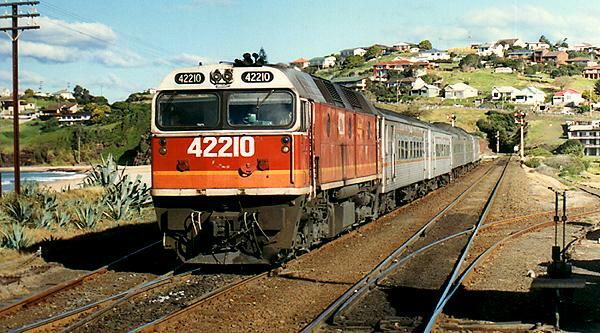 42211 leads the tulloch cars up the hill into Sutherland on April 14th, 1990. 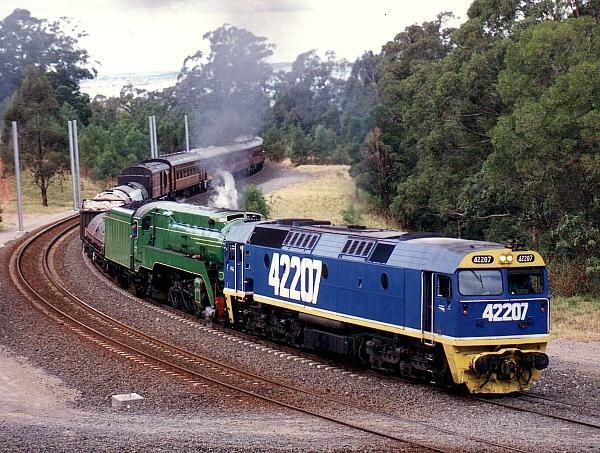 42203 & 42220 flank a 48 class on a down ballast train at Waterfall. 42203 & 42220 flank a 48 class on a down ballast train at Otford. 42218 hauls CL71 across the Como bridge on November 27th, 1990. 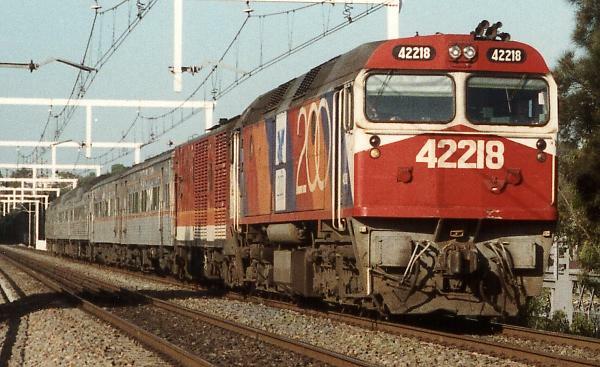 42210 on the up South Coast Daylight Express enters the loop at Bombo on July 4th, 1990. 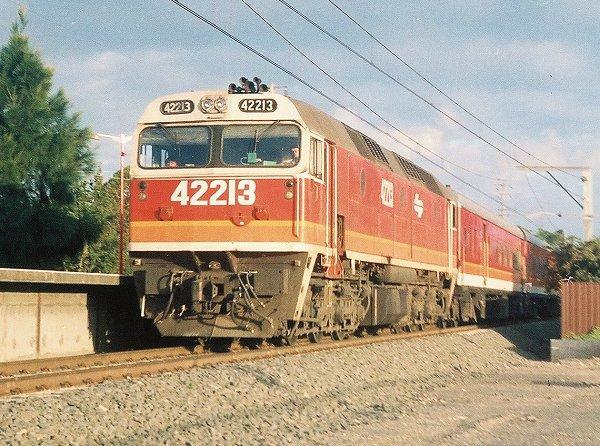 42218 in Bicentennial leads SL53 through Redfern on May 10th, 1990. 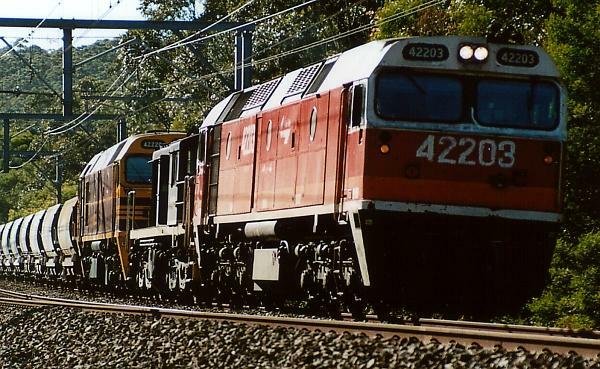 42210 and 42207 assist 8501, 8505 and 8509 on a 4200 tonne coal train near Sutherland on December 18th, 1994. 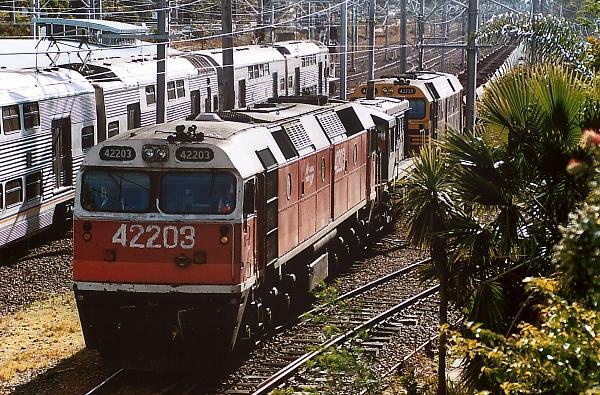 42209 and 42213 lead 9356DN into Kogarah on December 16th, 1994. 42220 leads SL15 Griffith Express up Exeter Bank on January 24th, 1998. 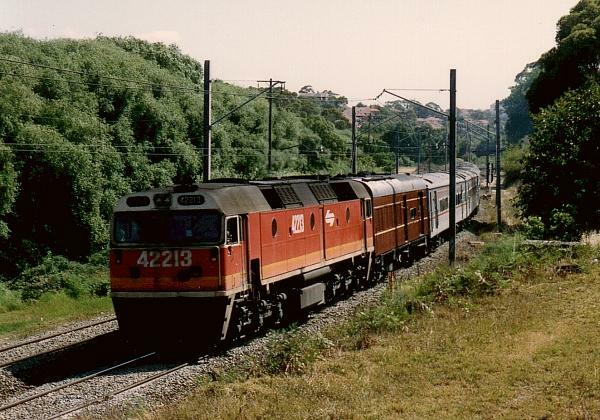 42213 leads a southbound passenger train at Bardwell Park due to a track closedown elsewhere on December 8th, 1991. 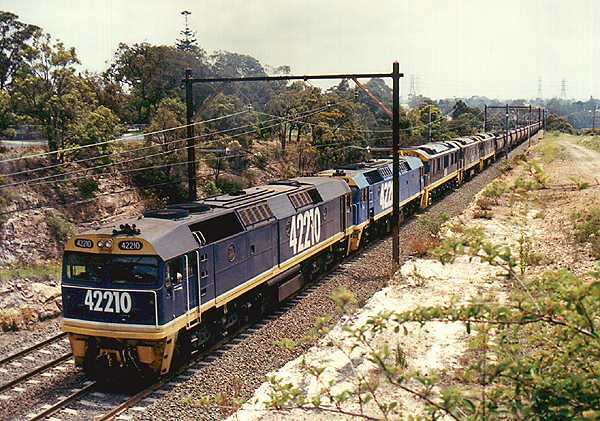 42207 leads 3801 on the Outback Explorer up the 1 in 30 at Farmborough Heights on August 15th, 1992. 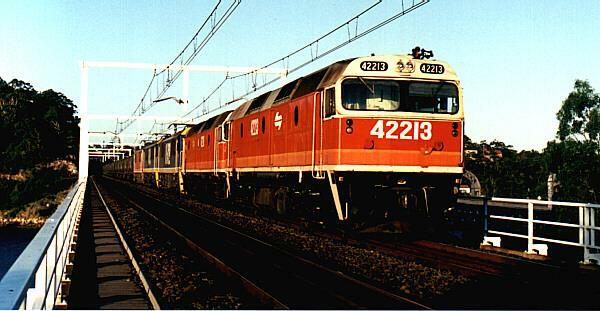 42216 is passed by V19 as it stands on a works train at Burwood on the 8th of January, 1997. 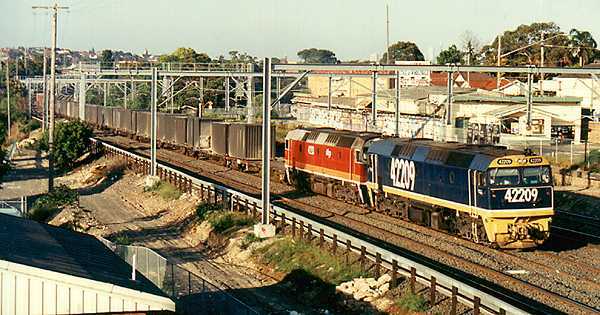 42213, 422xx, 86xx, 86xx, 86xx on a down coal train on Como Bridge. 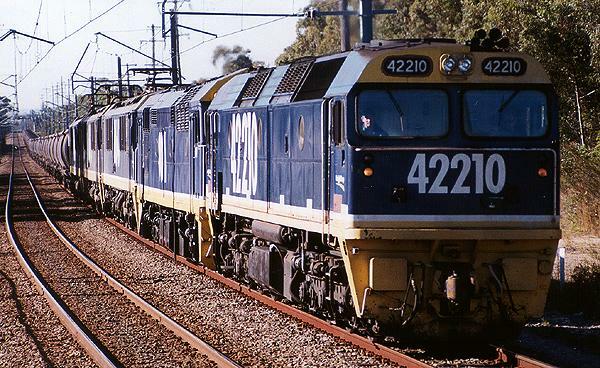 42210, 8011, 8647, 8635, 8642 on CA16 coal train at Engadine on July 2nd, 1999. 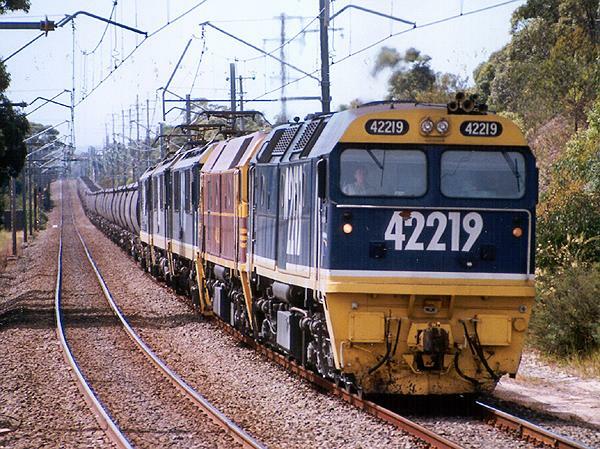 42219, 42220, 8630, 8631, 8642 on CA16 coal train at Engadine in March, 1999.